If you think that harvest time is a lot of work now, imagine having been involved in it anytime between 200 years ago and about three months after the first human planted a seed. Grains were planted by hand, carried to a cart by hand, separated by hand with help of a flail and then cleaned by hand. By grain I’m referring to mostly wheat, rice, barley and oats. It wasn’t until the middle part of the 19th century that what Americans call corn, which is relatively easier to harvest, became an important crop. In the middle part of the 19th century a guy named Cyrus McCormick developed the reaper, one of the first machines to use mechanical power, assisted by horses, to do what was once done by humans. From there the race was on to convert the entire harvest process to mechanical power. 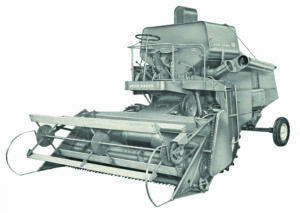 Improvements to steam and internal combustion engines certainly helped nudge the process along and soon threshers and combined harvester-threshers began to appear. Technology was still such though, that it wasn’t until well into the 20th century that anyone but those working the largest farms could afford, or had the room for, the massive combines which were necessarily pulled by steam traction engines or large kerosene burning tractors. However, as smaller tractors like the Fordson, McCormick Deering 1020 and John Deere “D” became more popular it wasn’t long before small combines designed for the average Midwestern farm began to appear. 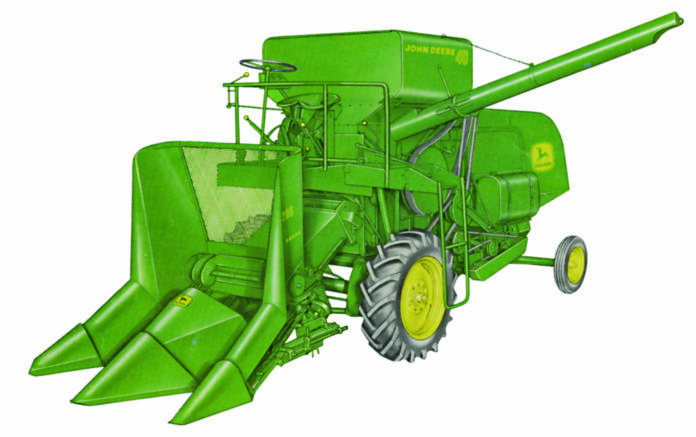 Deere’s first small combines were the models 10, 11 and 12. And when we say small we mean really small. The cutting width of the 10 was only three and a half feet. Despite good performance these three combines only lasted a year in production before they were switched from right hand cut to left hand, to better facilitate harvesting windrowed crops. They were also renamed the 10A, 11A and 12A. Despite fits and starts because of the war the big news in combines of the 1940s was self propelled machines. Deere built and tested several self propelled prototypes based on the 12A, but the idea of anything considerably smaller than the model 55 introduced in 1947 was apparently abandoned until 1954 when the model 45 was introduced. In 1958 a larger combine, the 95 was made available. The 12A had been updated with the model 25 in 1953 and the model 30 in 1956. 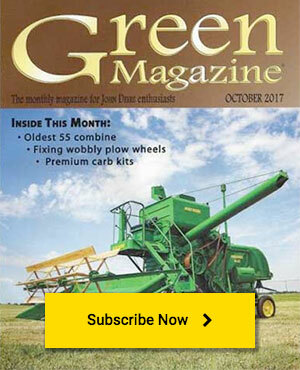 The Deere administration felt that there was still a market for a small pull type combine though they had gotten about as much as they could out of the old 12-25-30 platform. So, a new combine platform was developed that could be used for either a small pull type, or self propelled. Thus was born the model 40 self propelled and the model 42 pull type. In the fall of 1959 the model 40 was introduced at Marshalltown, Iowa. While it probably took a back seat to the new 8010 tractor also unveiled that day, it nonetheless received its share of attention. Powered by a Deere HA 115 engine developing 42 horsepower, the 40 could harvest virtually any combinable crop though it wasn’t recommend for rice. The cylinder was 24 5/8 inches wide and the grain tank held 35 bushels. It was a bare bones machine with no such options as a cab, power steering or comfortable padded seat. However the buyer could select options such as larger tires, a straw spreader, lights and individual wheel brakes. For specialty crops spike tooth cylinder and special sieves could be ordered. Few changes were made during the life of the 40 though it did get the “squareback” treatment along with the rest of the line in 1964. About that same time the grain tank capacity was increased to 42 bushels. Up front the buyer had their choice of an 8 or 10 foot direct cut head, windrow pick up or the new 205 corn head. 1966 was the last year for the model 40. The other combines in the line were due for power and other upgrades but sales figures apparently didn’t justify doing the same for the model 40 and production ceased. Admittedly not many people are going to count on a model 40 to bring in the harvest today, though one will make quite the conversation piece at a fair, seed company field day or anywhere else it can be compared with 21st century combines. Talk about up close and personal, running one you almost feel like the reel bats are going to hit your knees as they come around. Come to think of it, a model 40 would be a great machine for anyone who complains about their modern combine to do a few rounds on.